Header photo: Amy Linstaedt hard at work. You might know Jack Spade’s voice from Fargo-Moorhead radio, or as an overall loveable personality in the FM area. Amy Linstaedt, a Mortgage Loan Officer at Choice Bank in Fargo, knows him as a customer. He came in a year ago with his fiancé, Rachel, in hopes of getting pre-approved for a home loan. At the time, Jack was coming out of a poor experience with his previous financial institution. Years before, he had been forced to file for medical bankruptcy while he was sick with cancer, but they had recorded it as a traditional bankruptcy, which severely hurt his credit. Jack and Rachel were almost married and overjoyed at the thought of buying a house together. And yet with Jack’s credit at the time, Amy was unable to grant them the approval they needed. “It was a hard conversation,” Amy said. It was especially hard because Amy felt connected to this couple. She empathized with the fact that Jack’s medical bankruptcy came from being sick with cancer — something that is already physically and emotionally devastating, in addition to the financial strain. She also felt frustrated that the errors from their previous financial institution had hurt them in unnecessary ways — the opposite of what a bank should do. The way they recorded the bankruptcy for Jack continued to hang “like a black cloud over him,” she said. It was with this in mind that she approached the tough conversation with Jack and Rachel. She wanted to help them find the credit-building resources they needed to give them new hope. She outlined specific, actionable items to help the soon-to-be newlyweds build their credit, bit by bit. She created a timeline to show where they should be at each step along the way. In one year, Amy reassured, they should be approved. Disheartened but determined, Jack and Rachel left that day with a plan. And sure enough, about a year later, they came back to Amy ready to talk once again. They were hoping to move to Alabama and had a home in mind. Together they looked over their credit report. Amy was impressed. 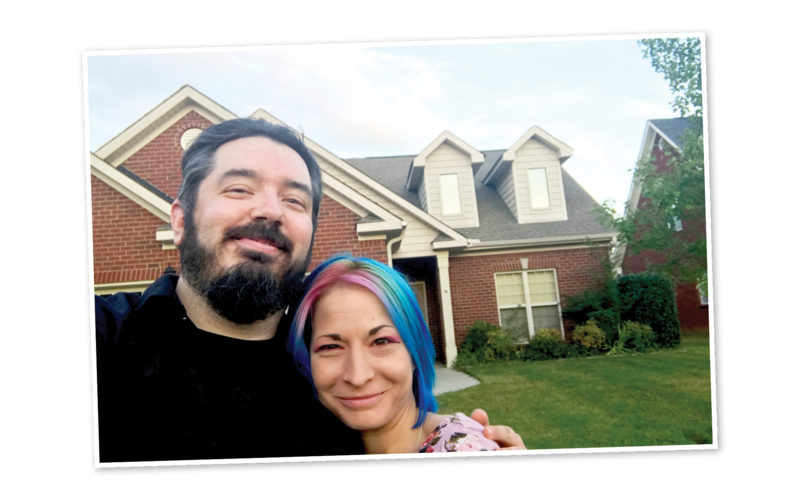 Thanks to their combined effort, Amy was delighted to grant them the pre-approval they needed for their dream home in Alabama. Jack and Rachel were elated. Jack and Rachel Spade pictured in front of their new home. So much so, in fact, that Jack had to share the story. A few weeks later, Choice Bank Vice President of Business and VIP Banking in West Fargo, Eddie Sheeley, was at an event-planning meeting for local non-profit CHARISM. Jack happened to be there as well and noticed Eddie’s Choice Bank shirt. He waited patiently while Eddie spoke with another organizer. When he finished, he approached with a big smile. “Do you work at Choice Bank?” he asked. “Yes, I do,” Eddie responded. Jack went on to express how thankful he is for Choice Bank, and especially for Amy and her help. He shared the story of how Amy helped he and Rachel build up the credit they needed. And how they were about to move to their dream home. “None of this would have been possible without Amy,” he said. Amy did both of these things when she decided to offer help, rather than leave them feeling helpless. Today, Amy continues to follow up with Jack and Rachel through Facebook as they settle into their new home in Alabama. “As far as I can tell, they’re having the time of their lives,” she said.